The Mass is God's great gift of love to His children. In it, the Good Shepherd feeds His sheep with His very own Body and Blood. In My First Mass Book, children are introduced to the Holy Mass. 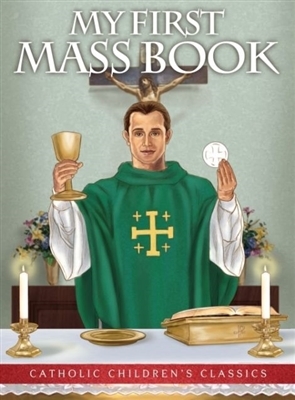 In these pages, children will be able to share in the Mass more fully. Sixteen original illustrations enhance the text, making learning about the Mass easy and interesting! The people's response are in bold type, which helps children to learn full, conscious, and active participation in the Holy Eucharist. Parents, grandparents, and all who care for children will enjoy many warm and wonderful teaching moments and worship experiences through the pages of this beautifully illustrated new classic.